Buried Rocquigny-Equancourt Road British Cemetery, Manancourt. HIS EXAMPLE - DEATH OF HASLINGDEN MANS WHO UNDERWENT OPERATION TO TAKE HIS PLACE IN THE TRENCHES. 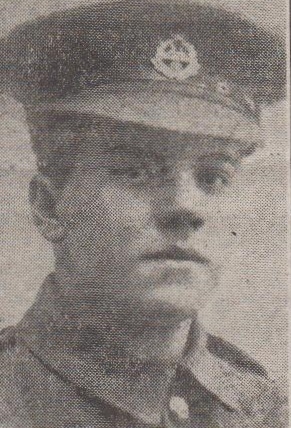 It is with regret that we record the death of Private Malcolm McEwan, East Lancashire Regt., of 2, Shore Street, Haslingden. He enlisted on November 19th 1915, and so eager was he to stand by his country in her hour of need and to do his bit to "make the world safe for democracy" that he underwent a very severe operation beforehand. After training he was drafted to the front, where he went through all the terrible fighting at the most severe part of the line. During last September he was home for a short leave, and his equipment bore evidence of the severity of the struggles through which he had passed. Dangerously wounded towards the end of January, he passed away on the 30th, and was buried in a military cemetery. Eulogistic letters have been received by his sorrowing relatives from the matron of the hospital, the chaplain of the unit, and the sergeant of his platoon. The deceased was 27 years of age, and was attached to the King Street Wesleyan Church. He was a member of the society and a scholar in the Sunday School. A memorial service will be conducted by the minister, the Rev. A.F. Hall on Sunday morning.